I wrote this piece for the Dallas Morning News. It was published on April 29, 1997. MEXICO CITY – They strip naked during public protests. They chain themselves to buildings. Beat up drunken cops. Chase down rapists. Fed up with a notoriously crooked judicial system, more and more ordinary Mexicans are seeking justice on their own terms. “True democracy just isn’t possible with an ineffective, unfair system of justice,” human rights worker Alfredo Castillo said. But reforming the judicial system may be the most difficult part of Mexico’s democratic transition, analysts say. Drug-related corruption has penetrated the upper reaches of law enforcement despite a dogged cleanup campaign headed by Mexican President Ernesto Zedillo. The judicial system still favors the rich and influential, many Mexicans say. And crime often pays: Only one in 10 killers is ever caught, official figures show. Some Mexicans believe that fixing the judicial system is a far-off dream. But others say the system is reaching a breaking point, thanks to a surge in people power. “Never before has the judicial system been under such pressure,” said Adolfo Aguilar Zinser, an independent federal deputy. “The government is being bombarded by disclosures of corruption. The traditional answer is, cover it up at any cost. “But that’s no longer possible. The authorities have to expose some cases of corruption to give the government credibility. That breaks down internal loyalties . . . and throws the system deeper into crisis. ” Most Mexicans – 95 percent – say that corruption is as bad or worse than it has ever been, according to a poll in Mexico City’s Reforma newspaper. But analysts say people are more determined than ever to clean up the system. The number of citizens’ groups aimed at such tasks as combating corruption and improving prison conditions has jumped from a few dozen a decade ago to more than 500 nationwide, human rights workers say. Mexicans “have lost all faith in their government and are looking for an alternative, anything,” said Sergio Aguayo, head of Civic Alliance, one of Mexico’s most influential citizens’ groups. The attitude toward corruption at the grass-roots level has changed dramatically in recent years, said Rafael Riviera, director of Defense of Prison Inmates, a Mexico City human rights group. “People are less tolerant of corruption, and they’re more willing to take action,” he said. “We used to call meetings on issues of human rights and justice and almost no one would come. Now we have meetings and anywhere from 20 to 100 people show up off the streets. ” The number of sit-ins, marches and hunger strikes in Mexico City has jumped from perhaps 10 a week in the 1980s to at least 50 a week, human rights workers say. And the protests have become more radical, with demonstrators doing everything from shedding their clothes to extracting their own blood to underscore their plight. Or they give up on peaceful protest and join vigilante gangs or rebel groups. The Popular Revolutionary Army, or EPR by its Spanish initials, says a lack of justice is the No. 1 reason for the group’s existence. EPR members began carrying out attacks on soldiers last year on the anniversary of the police massacre of 17 campesinos in the state of Guerrero. Despite the rising anger over injustice, many Mexicans are finding that changing the judicial system is extraordinarily difficult. Money and politics often determine who gets justice and who does not. In seeking justice, innocent Mexicans often become the victims. Consider a few examples: Three years ago a businessman approached Hermenegildo Martinez, 41, of Mexico City and asked him to design and make the molds for the cars used in a carnival ride. He said he did the work but wasn’t paid. When he complained, he said the businessman sued him and later threatened to kill him. Police thought to be in cahoots with the businessman shot at him and looted his home. Mr. Martinez fled. Later he went to the authorities for help, but they wouldn’t budge unless he bribed them. He now says it was a scam: His fiberglass molds were copied and pirated for profit. And the police were accomplices. “I was the victim. But they pursued me as if I were a murderer,” he said. “My designs are very original, very traditional. You can’t get them out of some catalog. But ever since I got into this mess, no one will hire me. I used to have six employees. Now I have none. I have to sell my work clandestinely. All because I complained about not being paid. ” In another case, Roberto Sanchez Torres, 23, his wife and his sister went to a street party in Mexico City in 1995. He got scared when he heard some shots and saw a scuffle between partygoers, so he gathered up his group and ran, his family says. Two people were killed that night. Police arrested Mr. Torres in August 1996 and accused him of murder. His family alleges that the father of one of the shooting victims paid the authorities to frame Mr. Torres. “He is innocent. We’ve found a dozen witnesses who say he didn’t do it,” said Arturo Vazquez, a lawyer for the family. “This is a case for Ripley’s Believe It or Not. ” “I’ve never been through anything so difficult,” said Mr. Torres’ mother, Virginia Torres, wiping tears from her eyes. “People tell me I look terrible, like I’m all used up. I tell them, `Well, how would you feel if you lost your right arm? ‘ My son was so devoted to me. `Everything for my mother,’ he used to say. And that didn’t change even when he got married. ” Now in prison, her son must pay bribes for even basic necessities, such as sleeping on a mattress, she said. His mother prays for his release. “God sometimes takes awhile, but he never forgets,” she said. Mr. Vazquez, head of the Judicial Alliance, a private Mexico City group that offers free legal aid to victims of the justice system, said such episodes are not unusual. “If you have money, you can get yourself out of any problem,” he said. “But for the poor, Mexican law is highly repressive. “We lawyers say these practices will end the day after Mexico falls. That is to say, never. ” In the state of Morelos, south of Mexico City, residents have banded together to try to end a wave of kidnappings that began in 1994. What they suspect – and what they’ve made public – is that in many cases, police officers participate in the kidnappings. The response from the authorities has not been encouraging. has fabricated three cases against them, accusing them of slandering the authorities. “I had to send my daughters to the United States because they’ve been threatened and intimidated,” said Carmen Genis Sanchez, leader of a nongovernmental group that has denounced the kidnappings. “But we’re fed up, and that’s why we’re willing to show our face and continue telling the truth. ” The kidnapping victims include Francisco Gerardo Resendiz, who disappeared July 23, 1995. His father, Francisco Resendiz Carreno, 47, said he paid a ransom of 310,000 pesos – nearly $40,000 – but hasn’t heard from his son. “I’ve tried to get help from the authorities, but they won’t see me anymore,” said Mr. Resendiz, who buys and sells pigs for a living. “They give me the runaround, thinking I’ll get bored and leave. But I won’t give up until I know what happened to my son. ” Many Mexicans say the justice system’s failings are most severe in impoverished southern states such as Chiapas, Guerrero and Oaxaca, where dozens of murders go unsolved every year. Pedro Cruz Osorio, 74, was in a hammock watching the news on television on New Year’s Eve when three men stormed in and pumped six bullets into his body. His family suspects that he was killed over a land conflict that has gone on for generations in rural Oaxaca. But they have no way of knowing for sure. “The murder hasn’t even been investigated,” said the victim’s niece, Felipa Cruz Gonzalez. “The authorities don’t want to touch it. ” In the neighboring state of Guerrero, residents have similar complaints. “There’s no government here. No law. No police. We’re like little chicks abandoned by the mother hen,” said Jose Florentino Lopez, a farmer who lives in a wind-swept settlement called Rancho Nuevo La Democracia – New Ranch of Democracy. Mr. Florentino and others say they are so frustrated with the authorities that they no longer let police or soldiers into the dirt-poor community. And when a ruling party candidate stopped by the village recently, townspeople hung him by his wrists before finally letting him go. “The government says we’re rebels. But we’re rebels out of necessity, out of hunger,” said Lauro Garcia Vazquez, a leader of the community. “There’s no justice here. ” He rattles off the names of those who have been murdered in the region: Alejandro Tenorio Perfecto, Rufino Gonzalez Perfecto, Rey Flores Hernandez, Alfredo Morales Vazquez, Jose Porfirio Bautista, Jose Ortiz Tellez, Jose Francisco Andres. “People get killed all the time, but the authorities almost never look into it,” said Jose Jaimes Requena, an activist with the left-of-center Democratic Revolutionary Party, or PRD, in Guerrero. New Ranch, a community of about 1,000, used to be called Old Ranch. Villagers renamed it and declared their independence from the federal government. The region is considered “in rebellion,” they say. The perception that there is no justice sometimes leads to vigilantism. Gangs of residents in Mexico City are known to beat up police officers who drive drunk and get into traffic accidents. In small towns south of the capital, vigilantism is even more common: * In September 1994, townspeople in Chacaltzingo captured three men who had tried to kidnap three girls. They beat up two of the men and dragged the third to a basketball court where they were going to hang him. Impatient, they killed h im with a shotgun blast to the neck. * In December 1994, resident of Hueyapan attacked a man accused of stealing a tape recorder. They tied the man to a horse, dragged him through the streets, then hanged him. * In November 1995, townspeople in Xoxocotla jailed a man suspected ofraping and stabbing a 19-year-old woman. A few hours later, a resident strolled into the jail and killed the man. Human rights experts say such incidents create an atmosphere of chaos. “When the state does not enforce the law and individuals assume the role of private law enforcers, lawlessness and insecurity prevail,” said a November 1996 report, “The Rule of Lawlessness in Mexico,” by the Minnesota Advocates for Human Rights. Public pressure sometimes prods the authorities into action, but the results often fall short. Rosario Ibarra, leader of a group of mothers whose sons or daughters have been killed or imprisoned for political reasons, cites the so-called Aguas Blancas massacre. A Mexican Supreme Court commission determined that former ruling-party Gov. Ruben Figueroa of Guerrero helped cover up the police killing of 17 peasants. But prosecutors refused to touch Mr. Figueroa. In another case, prosecutors dropped an investigation into Gov. 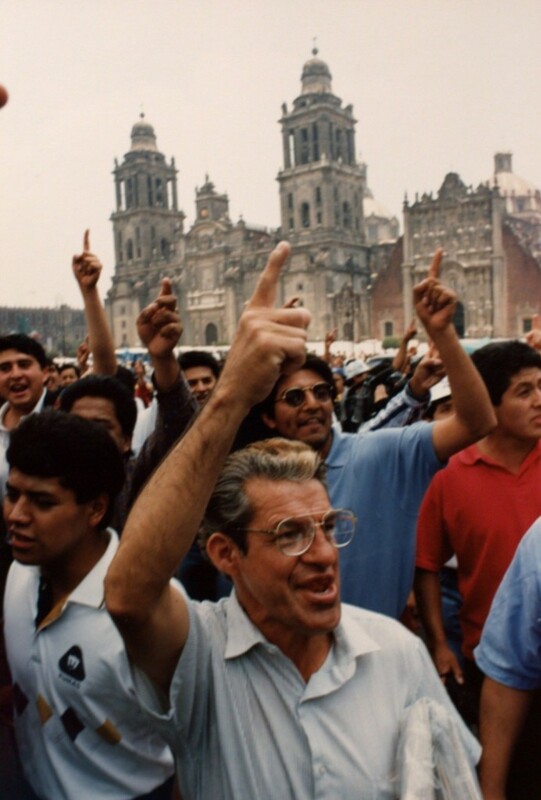 Roberto Madrazo of Tabasco, accused of spending tens of millions of dollars more than electoral law allowed during his 1994 campaign. “It’s an embarrassment,” Ms. Ibarra said. The ruling powers and the justice system are “like twin brothers. They look out for each other. ” Mexican authorities concede that accountability is still a new concept for many people. When journalists asked Mexico City mayoral candidate Alfredo del Mazo if he would be willing to reveal his salary and assets if elected, he seemed stunned and refused to answer. Reporters repeated the question, and Mr. del Mazo shot back: “Why ask only the mayor? Why not ask everyone? ” Mexico’s new drug czar, Mariano Herran Salvatti, was also asked his salary. “At the moment . . . I don’t have that information,” he said. “You haven’t been paid yet? ” a reporter asked. “No, I haven’t been paid,” he replied. Mr. Herran’s predecessor, Jesus Gutierrez Rebollo, was jailed on suspicion of taking payoffs from Mexican drug lords. Mr. Gutierrez, a former high-ranking army general, joined dozens of military officers who were assigned to clean up the judicial system. His arrest, analysts say, showed that the authorities have a long road ahead. “It’s not that the Mexicans aren’t concerned,” said Tom Cash, a former top official with the U.S. Drug Enforcement Administration. “When they start putting military leaders into law enforcement’s highest investigative positions, that tells me the government is very concerned. ” While the fight to stop high-level corruption continues, street-level graft goes on unabated. Traffic police are some of the most blatant offenders. “Pay me 60 pesos and I’ll pretend I didn’t see you go through that yellow light,” a Mexico City officer told a motorist recently. “Or we can remove your car’s license plates, and you can pick them up at the police station later. And I guarantee you’ll pay more money. ” The motorist forked over the 60 pesos, about $8. “Like it or not, that’s the system,” the officer said, pocketing the cash.